Grab the guide. Start building. Why download this community platform guide? Want to know how to pick the right platform for your community? This is your one-stop guide to making the decision and finding the best platforms on the market to fit your need. 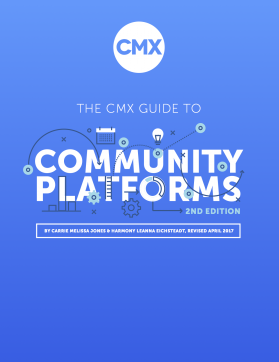 Get free access to the most comprehensive guide to community software. Only 40% of community professionals say they expend a "high level of effort" choosing the right community platform. * Yet the most successful communities treat this process with rigor. *Statistic from "The Keys to Community Readiness and Growth" Research by CMX and Leader Networks, 2016.